Long before the Campbell’s soup cans, the Elizabeths, the Marilyns, and the Maos, there were shoes. Andy Warhol loved to draw them—high heels, pumps, or jeweled stilettos– many of them were blotted-line drawings, filled in with color, and created when the artist was a commercial fashion illustrator in 1950s New York. Diamond Dust Shoes by Andy Warhol – In the 1980s, Andy Warhol returned to one of his primary motifs from the 1950s with his series Diamond Dust Shoes. In Diamond Dust Shoes, Andy Warhol placed glittering, multi-colored arrangements of women’s shoes against black backgrounds. As a successful commercial artist, Andy Warhol’s acclaim escalated when he drew imaginative images of shoes for the retail store I. Miller. 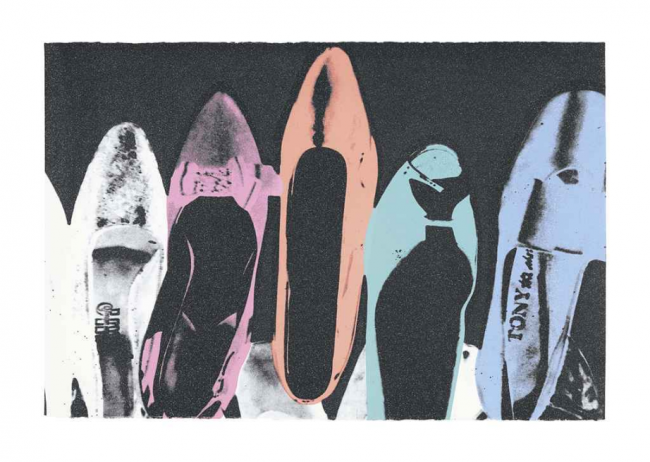 Andy Warhol returned to his roots as a commercial illustrator, by creating his “Shoes” series. Warhol implemented his signature style of repetition, arranging the shoes in a seemingly haphazard, yet methodical manner. The composition provides a candid perspective of shoes, spilled out on the floor in no particular order, but also presents the various views of the classic high-heel, leaving no element of the shoe hidden. The conceptualization of these prints, undoubtedly, is a revival of the beginning of his artistic career in which his specialty was none other than women’s shoes.